هوشمند, پیام, سیدین, فرید, روشندل, رامین. (1393). مدلسازی سیستم تبدیل انرژی از پسماندهای شهری با بهره گیری از سیستم هیبریدی گازی‌سازی-پیل سوختی کربنات مذاب. نشریه پژوهشی مهندسی مکانیک ایران, 16(4), 98-122. پیام هوشمند; فرید سیدین; رامین روشندل. "مدلسازی سیستم تبدیل انرژی از پسماندهای شهری با بهره گیری از سیستم هیبریدی گازی‌سازی-پیل سوختی کربنات مذاب". نشریه پژوهشی مهندسی مکانیک ایران, 16, 4, 1393, 98-122. هوشمند, پیام, سیدین, فرید, روشندل, رامین. (1393). 'مدلسازی سیستم تبدیل انرژی از پسماندهای شهری با بهره گیری از سیستم هیبریدی گازی‌سازی-پیل سوختی کربنات مذاب', نشریه پژوهشی مهندسی مکانیک ایران, 16(4), pp. 98-122. هوشمند, پیام, سیدین, فرید, روشندل, رامین. مدلسازی سیستم تبدیل انرژی از پسماندهای شهری با بهره گیری از سیستم هیبریدی گازی‌سازی-پیل سوختی کربنات مذاب. 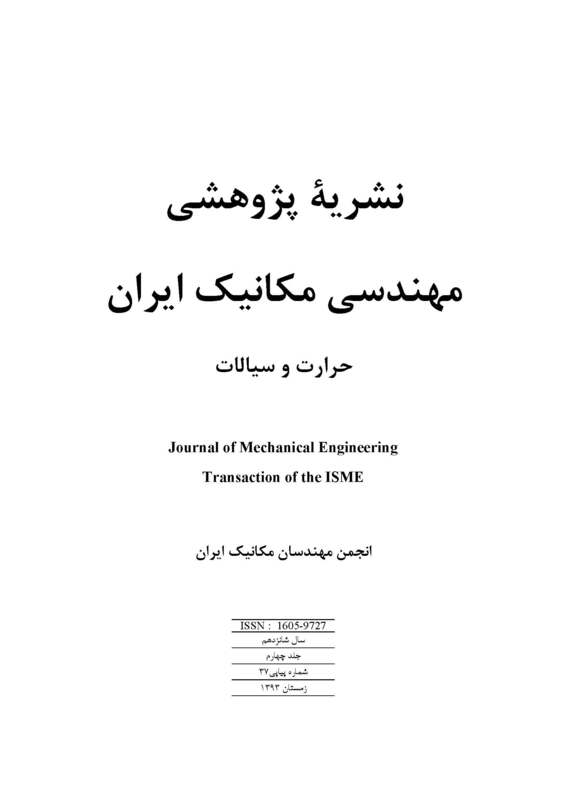 نشریه پژوهشی مهندسی مکانیک ایران, 1393; 16(4): 98-122. 1[ عمرانی، قاسمعلی، مواد زائد جامد، مرکز انتشارات دانشگاه آزاد اسلامی، جلد 1 و 2، تهران، (1383). ]2[ فصلنامه آماری مدیریت مواد زائد جامد شهر تهران، سازمان بازیافت و تبدیل مواد، شماره دوم، تابستان (1382). Visvanathan, C., Trankler, J., Kuruparan, P., Basnayake, B.F., Chiemchaisri, C., Kurian, J., and Gonming, Z., “Asian Regional Research Programme on Sustainable Solid Waste Landfill Management in Asia”, Proceedings Sardinia, Tenth International Waste Management and Landfill Symposium, Environmental Sanitary Engineering Center, Italy, (2005). Puig Arnavat, M., Coronas, A., and Carless Bruno, J., “Performance Modeling and Validation of Biomass Gasifiers for Trigeneration Plants”, Department of Mechanical Engineering, Universitat Rovirai Virgili, Tarragona, October, (2011). Kirill, V.L., and Horst, J.R., “An Advanced Integrated Biomass Gasification and Molten Fuel Cell Power System”, Energy Conversion and Management, Vol. 39, No. 16-18, pp. 1931-1943, (1988). Bang Moller, C., and Rokni, M., “Thermodynamic Performance Study of Biomass Gasification, Solid Oxide Fuel Cell and Micro Gas Turbine Hybrid Systems”, Energy Conversion and Management, Vol. 51, Issue. 11, pp. 2330-2339, (2010). Aloui, T., and Halouani, K., “Analytical Modeling of Polarizations in a Solid Oxide Fuel Cell using Biomass Syngas Product as Fuel”, Applied Thermal Engineering, Vol. 27, Issue. 4, pp. 731-737, (2007). Morita, H., Yoshiba, F., Woudstra, V., Hemmes, K., and Spliethoff, H., “Feasibility Study of Wood Biomass Gasification/Molten Carbonate Fuel Cell Power System-comparative Characterization of Fuel Cell and Gas Turbine Systems”, Journal of Power Sources, Vol. 138, pp. 31-40, (2004). Kumar Sharma, V., “Research and Development Activities on Biofuels”, Expert Group Meeting on Biofuels and Bio Based Chemicals: An Opportunity for Developing Countries? Organized by ICS-UNIDO, Trieste, Italy, 9-11 May 2011, Enea Research Center Trisaia, Trieste, Italy, (2011). Jarungthammachote, S., and Dutta, A., “Thermodynamic Equilibrium Model and Second Law Analysis of a Downdraft Waste Gasifier”, Energy Journal, Elsevier, Vol. 32, No. 6, pp. 1660-1669, (2007). Smith, W.R., and Missen, R.W., “Chemical Reaction Equilibrium Analysis:Theory and Algorithms”, Wiley, New York, USA, (1982). Perlack, R.D., Wright, L.L., and Turhollow, A.F., “Biomass as Feedstock for a Bioenergy and Bioproducts Industry: The Technical Feasibility of a Billion-Ton Annual Supply”, The United States Department of Agriculture (USDA) and the United States Department of Energy (DOE) Prepared by Oak Ridge National Lab, Oak Ridge, The Technical Feasibility, (2005). Zainal, Z.A., Ali, R., Lean, C.H., and Seetharamu, K.N., “Prediction of the Performance of a Downdraft Gasifier using Equilibrium Modeling for Different Biomass Materials”, Energy Conversion and Management, Vol. 42, pp. 1499-1515, (2001). Higman, C., and Van Der Burgt, M.J., “Gasification, USA: Gulf Professional Pub”, (2003). Rashidi, R., Berg, P., and Dincer, I., “Performance Investigation of a Combined MCFC System”, International Journal of Hydrogen Energy, Vol. 34, pp. 4395-4405, (2009). Gomez-Barea, A., and Leckner, B., “Modeling of Biomass Gasification in Fluidized Bed”, Progress in Energy and Combustion Science, Vol. 36, pp. 444–509, (2010). Subramanian, N., Haran, B.S., White, R.E., and Popov, B.N., “Full Cell Mathematical Model of a MCFC”, Journal of the Electrochemical Society, Vol. 150,No. 10, pp. 1360-1367, (2003). Donolo, G., De Simonb, G., and Fermeglia, M., “Steady State Simulation of Energy Production from Biomass by Molten Carbonate Fuel Cells”, Journal of Power Sources, Vol. 158, pp. 1282–1289, (2006). Stauft, C., Heynen, Ch., Gregory, J., Abernethy, J., and Krishnamoorthy, A., “Green Lane Landfill Waste Reduction Proposal”, The University of Western Ontario, Faculty of Engineering, GPE 4484A-Green Fuels and Chemicals, Industrial Proposal, (2011). Au, B., McPhail, S., Woudstra, N., and Hemmes, K., “The Influence of Operating Temperature on the Efficiency of a Combined Heat and Power Fuel Cell Plant”, Journal of Power Sources, Vol. 122, pp. 37-46, (2003).